For your convenience, tickets can be purchased at The Lyric Box Office, over the phone or online at lyrictheatre.com. Where is The Lyric Box Office located? The Box Office is located at The Lyric main entrance - 59 SW Flagler Avenue. We accept Discover, American Express, Visa, Mastercard, cash and checks. How can I pick up my reserved tickets? All reserved tickets are available at The Lyric Theatre Box Office during regular Box Office hours and 2 hours prior to show times. Online ticket buyers can print out their tickets at home. Simply present your electronic ticket print out to ushers and take your seats. No more Box Office lines! Will I get a discount for a large group of people? Discounts are available for groups of 10 or more. Please call our Box Office at 772-286-7827 or email LyricBoxOffice.com for assistance. Is there a beverage service available? Yes, a cash bar is located in the lobby before the performance and during intermission. Is The Lyric Theatre handicap accessible? Yes, special seating arrangements can be made with the Box Office at the time you purchase your tickets. There are designated seats that are wheelchair accessible, as well as a 10 person elevator in the east end of the lobby which provides easy access to the balcony level. Please notify Box Office personnel when purchasing your tickets of any special needs that your party may have. They are located to the left and right of the Theatre auditorium doors. Yes, please see the House Manager. Can I take pictures or record the performance? It is against The Lyric Theatre policy to take any photographs or take audio or visual recordings without the express permission of The Lyric Theatre Management. Violators will be asked to leave the performance. Latecomers and people leaving a performance before it is completed will not be admitted until a suitable break in the performance. How can I support The Lyric Theatre? There are many ways in which you can show your support for The Lyric. Check out our "Ways to support The Lyric" page to see how you can help. Donate Today! Your contributions ensure our continued presence in our community. For information on how you can contribute, contact Linda Prange, Development Director at 772-220-1942, ext. 209 or Development@lyrictheatre.com. Can I rent The Lyric Theatre? Yes, we can provide a perfect setting for your group or special event. The auditorium and lobby are available for private performances or receptions. To book The Lyric Theatre please contact the Moises Miguel at moises@lyrictheatre.com. Take the first Stuart Exit #110. Make a left turn onto Hwy 714 (Martin Highway). Make a left turn onto Martin Downs Blvd. The turnpike entrance will be on your right. Continue on Martin Downs Blvd approx 3 miles. Cross over Palm City Bridge. At light turn left onto Kanner Hwy (also called Hwy 76). A Hess Gas Station will be on your right. Continue on Kanner which turns into Colorado when you cross. U.S. Hwy 1. After crossing US 1, continue straight, move into the left lane when possible. Approx 1 mile you'll come to Confusion Corner. You'll know that you are there because you'll be confused! This is a traffic circle. Drive counterclockwise and turn right onto Flagler Ave. before you cross over the tracks again. Keeping the tracks on your left, drive north on Flagler. 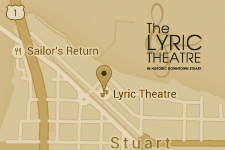 The Lyric Theatre is near the end of the block on your right. There is additional parking across the tracks in the lot by Sailfish circle. Proceed approx. 7 miles to Confusion Corner. You'll know that you are there because you'll be confused! This is a traffic circle. Drive counterclockwise and turn right onto Flagler Ave. before you cross over the tracks again. Exit at #133 and drive straight onto Martin Downs Blvd. After crossing US 1, continue straight. There is additional parking across the tracks. Turn right onto Flagler Drive. The Lyric will be on your left. If you turn before the railroad tracks, you will be on Old Dixie where you will find additional parking.